Partly cloudy, with a low around 41. North wind 9 to 13 mph. Sunny, with a high near 64. North wind 10 to 16 mph, with gusts as high as 24 mph. Clear, with a low around 39. West northwest wind 5 to 8 mph. Community - Stanberry Textcaster Sign Up! Scholar bowl team makes it to state! 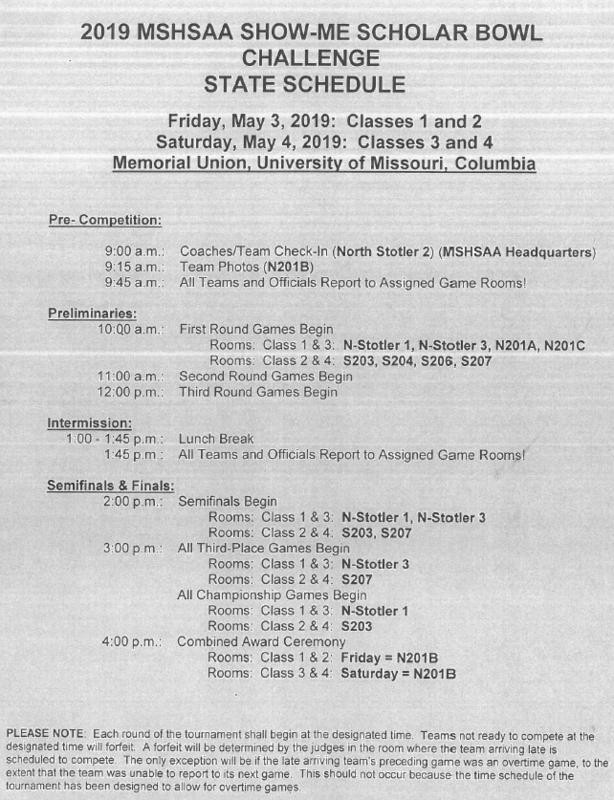 Note: Finals to follow Preliminaries. 9:30 a.m. 11:30 a.m. 1:30 p.m. 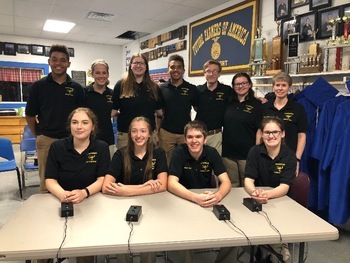 The Stanberry R-II School District is seeking applicants for a Jr. High Science teacher for grades seven, eight, and nine for the 2019-2020 school year. Stanberry R-II is a high performing school district in northwest Missouri with outstanding parent and community support. We are in search of candidates that are looking for a school and community to call home. 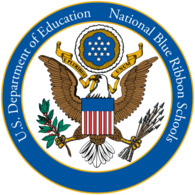 Stanberry R-II has received the MARE Rural School of the year award and has earned Gold Star and Blue Ribbon status. Apply to join the Stanberry Family. Applications are available upon request from the Superintendent's office at 660-783-2136 and/or online at www.sr2.k12.mo.us by clicking on Applications under the District tab. Applicants should hold appropriate credentials and Missouri Certification or have the ability to obtain such certifications. The Stanberry R-II School District is seeking applicants for a High School Science teacher for grades 10-12 for the 2019-2020 school year. Applicants need to be certified or obtain the necessary certification to teach Chemistry. Other course offerings include Biology and dual credit opportunities. 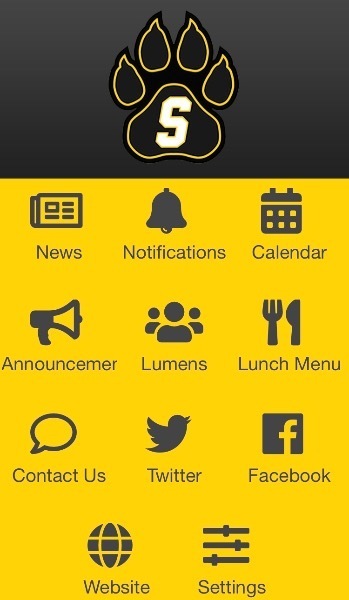 You can now download the Stanberry mobile app! Just go to the App Store and search “Stanberry”! Click here to order your Josten's Yearbook for your SHS Student! Did you know you are now able to subscribe to our calendar? You can download an event or calendar to your own ical compatible calendar or take the SOCS Calendar URL and download to a calendar that supports calendar subscribing, such as a Google calendar. To subscribe to a calendar, select the Calendar link from the front page of the website under Community link on the right. You will be taken to the Calendar page and will see the below options. You have three different options to subscribe to the calendar. First, filter the calendar(s)/categories you want to download to your personal ical compatible calendar. Once that is complete, select one of the below options: 1. Select the Subscribe link to download the file. It will go to your Downloads folder. Then you can upload the file to your personal calendar. The method for uploading the calendar will vary depending on what personal calendar system you use. 2. To subscribe to the calendar, place your cursor over the Subscribe link to copy and paste the link. You can then use that url to subscribe to the calendar in your . . .
APRIL: Courage – Doing the right thing in face of difficulty and following your conscience instead of the crowd.